“Welcome to Quazarz,” the first, official video from Quazarz vs. The Jealous Machines - Directed by Nep Sidhu - is viewable here via Black Constellation’s new YouTube channel. 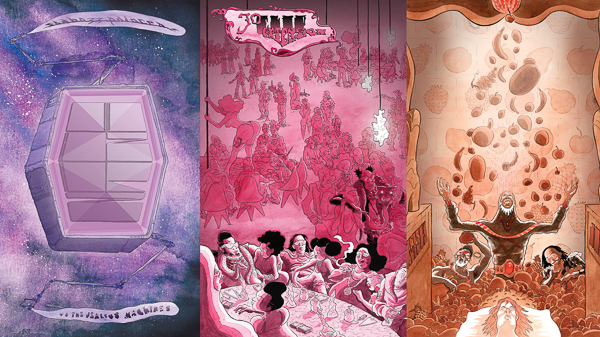 Shabazz Palaces’ Quazarz: Born on a Gangster Star and Quazarz vs. The Jealous Machines, the group’s third and fourth albums, will be available in finer independent record stores on CD / LP / DL / CS tomorrow, Friday, July 14th worldwide through Sub Pop. These releases follow the group’s critically acclaimed 2014 release, Lese Majesty. Join US. Trust US. WE know what is best. Sleep more. Watch more. Eat gristle. Drink pop. Do Less. JoinUS. Trust US. WE know what is best. Sleep more. Watch more. Eat gristle. Drink pop. Do Less. We received the beams and mixed them for the youth of ourterra so that they might know that they were not alone, that the revolution of resolution was still well underway. We saw shattered fragments of the ritual dance that sustained them even in the midst of thetechno tyranny. It’s form was fitting as they like us were shards of what was Once. They needed To know that theQuazarian fight mirrored their own and that there was hope in both the old ways and the new. Quazarz: Born on a Gangster Star and Quazarz vs. The Jealous Machines are available for purchase now from Sub Pop right here. 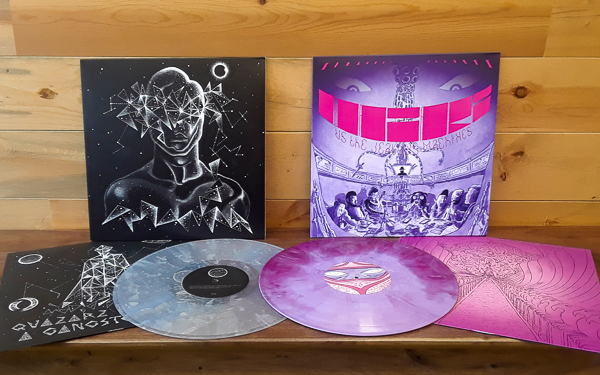 LP orders for each album from megamart.subpop.com and select independent retailers will continue to receive the limited “Loser” edition on colored vinyl (…Jealous Machines on mashed-up purple; …Born on a Gangster Star on aluminum) while supplies last. Both albums can be purchased together from Sub Pop as a special bundle, and there are also new T-shirt designs associated with each release (one for …Born on a Gangster Star and two for …vs. The Jealous Machines). Quazarz: Born on a Gangster Star, which includes tracks “Shine A Light” (feat. Thaddillac), “Since Caya,” “When Cats Claw” and Moon Whip Quäz (feat. Darrius),” was produced by Knife Knights (aka Ishmael Butler and Erik Blood) and recorded and mixed by Blood at Protect and Exalt Labs: A Black Space in Seattle. Quazarz vs. The Jealous Machines, which includes tracks “30 Clip Extension” “Effeminence” and “Julian’s Dream (Ode to a Bad)” was produced by the Palaceer Lazaro and Sunny Levine, recorded in Seattle at Protect and Exalt Labs: A Black Space and in Marina Del Rey at Dror Lord Studios, and mixed by Levine and Kamal Humphrey at Kamal’s House Studio. Shabazz Palaces have extended their 2017 tour schedule in support both Quazarz: Born on a Gangster Star and Quazarz vs. The Jealous Machines with international dates that begin July 13th-16th at Cascadia Festival in Granite Falls, Washington run and through November 9th-12th at Le Guess Who? Festival in Utrecht, Netherlands. The European leg of the tour will visit 23 cities including Copenhagen, Stockholm, Oslo, Istanbul, Vienna, Prague, Berlin, Geneva, Paris, Dublin, London, Glasgow, and Brussels. Older Entry: METZ Announce Their Ferocious Third Album, 'Strange Peace' (out 9/22); Now Hear Lead Track, "Cellophane"